I purchased the Godin LG Signature a couple of months after I bought the Godin Solidac. I went to a music store in the area who sold Godin guitars as part of their inventory in their showroom. I wanted to compare the Godin LGX’s piezo bridge to the Solidac’s. The LGX definitely did sound a bit better than the Solidac, and cost over twice as much! While I was in the store one of the sales guys pointed out that Godin’s new LG Signature just came in and I should check it out. He said the Seymour Duncan pickups in the LG Signature sound really great. I tried the guitar out, and decided they were right. I really liked the guitar. I made a deal with the manager of the store to let me take the LG Signature home to try it with my own rig over the weekend in exchange for a $100 credit card security deposit, which could be applied to the purchase price of the guitar if I decided to buy the guitar, or would be credited back to my account when I brought the guitar back to the store. The LG Signature specs are listed below. As you can see from the picture I purchased the LG Signature in Transparent Black with a carved AA flame maple top. The LG Sig is quite pretty in my opinion. The guitar has a tune-o-matic bridge, but instead of having the usual stop tailpiece, the LG Signature features string through the body design where the ball end of the strings are held by a brass plate screwed on to the back of the guitar. This system works quite well coupling the string vibrations to the mahogany body, which adds resonance to the guitar’s sound. The neck is a bolt-on design, but the way Godin does this the guitar plays like a set neck guitar. The scale length is 25.5 inches, which is not what you usually expect with a mahogany guitar with a maple cap, but this gives you a lively playing guitar with good snap. The pickups are a Seymour Duncan Jazz in the neck and a specially wound Custom Custom for Godin in the bridge position, so I guess you could consider the pickup to be a Custom Custom Custom, with nickel pickup covers. There is a five position selector switch, which gives you neck humbucker, neck coil-tapped (for single coil sounds), neck and bridge humbuckers combined, bridge coil-tapped, and bridge humbucker. This affords you a large assortment of tonal options. The Rosewood fingerboard is attached to a fairly thick mahogany neck (some guys I know had their LG Sig’s neck shaved down, but I kept mine nice and fat for better stability). The nut is a Tusq nut, and the frets are nice jumbo frets that were dressed and finished quite well. The tuners turn smoothly, sporting black tuning knobs, with good tuning stability. There is a master volume and tone control, so the typical dual humbucker pickup selector switch stutter effect is not possible from the stock guitar controls, nor is having different switchable volume and tone settings for the neck and bridge pickups. Most of the hardware on the guitar is black. The Godin LG Signature is a dream to play. It has a very comfortable belly cut on the back of the body, and a nice ergo-cut neck with acceptable access to the upper frets. The pickup selector switch, volume and controls are placed nicely as well. I set the guitar up for slide guitar playing and/or regular guitar playing without a slide. The strings are set slightly higher on the treble side than in a typical setup. 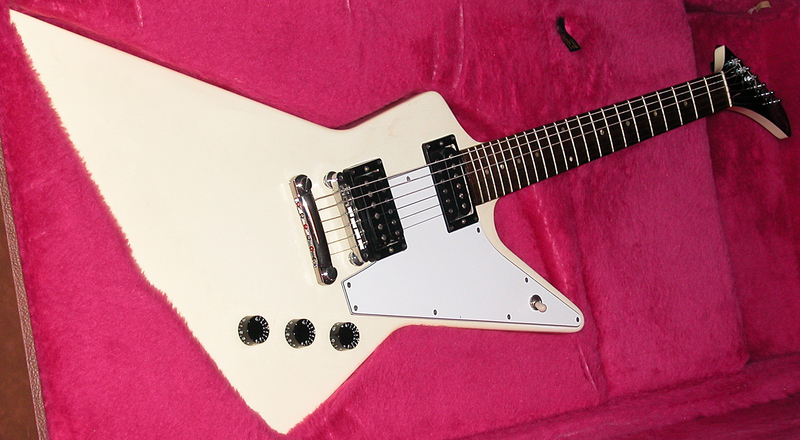 Also due to the higher string tension afforded by the 25.5-inch scale length and the fixed bridge, this guitar is a good candidate for alternate tunings such as tuning a half step down or drop tunings on the low E string, where the strings will tend to get too slack on 24.75-inch scale length guitar, without going to a thicker string gauge. If you go all the way to drop C or drop B I would suggest using heavier gauge strings for better string tension. This guitar sounds good through a cleanish amp. It can get close to some nice Strat tones when the neck pickup is coil-tapped. The bridge pickup in split-coil mode is a nice option when you want a brighter tone, that sounds thinner, with slightly less drive than in humbucker mode, but does not get overly ice-picky. The humbucker tones are nice and thick and sound great with some overdrive or distortion. The LG Signature makes for a really nice all around guitar for Pop, Blues, Rock, Country or Jazz. Below is a video of me playing the LG Sig with a band I used to play with covering Alice In Chains, Man In A Box. The recording was done with a small camcorder on a tripod, but this will give you an idea on how she sounds for heavy Rock music. Below the video is a quick sound clip of the Godin LG Sig into my modified Fender Pro Junior. If you are interested in purchasing a Godin LG Signature the used market (Ebay, Reverb.com, etc.) is where you would want to look, since the guitar is no longer listed on Godin’s updated web site. If you play guitar in a praise and worship band or any musical group for that matter, the Godin Solidac is an electric guitar you may want to consider finding on the used market (Godin no longer manufactures this model). I bought this guitar after playing in a praise band for a bit. I thought it would be cool to have acoustic and electric guitar sounds at my disposal. The Godin Solidac is a dual voice guitar with HSH (humbucker, single coil, humbucker) magnetic pickups mounted to the pickguard and a piezo pickup in each bridge saddle. Here are the latest specs for the Godin Solidac from Godin’s web site. Below is Godin’s description/marketing copy of the Solidac guitar from their website. The Solidac is the latest Godin model to offer the two-voice concept. It combines the sound of magnetic pickups (electric guitar) with a bridge transducer system for acoustic sounds. This guitar offers players the versatility of a humbucker-single-humbucker pickup configuration along with a transducer-equipped tremolo bridge. All of this sonic power comes in an instrument that sports the same ultra comfortable Mahogany neck found on the LGX with a Silver Leaf Maple body. Individual outputs are provided for the magnetics and the bridge, with the bridge output doubling as a mix out for both signals when used alone. There is an internal preamp voiced to provide excellent acoustic sound when used with any full range system and it produces very good acoustic tone even when plugged into a regular guitar amp. The Solidac represents an opportunity for players on a tighter budget to consider a two-voice concept guitar that retains all of the hand-finished quality that is a standard feature in every Godin instrument. I agree with most of what is said there. The built-in preamp for the acoustic bridge piezo output on the whole did not cut it for me, the main reason for this is there is not any way for the user to adjust the EQ of the acoustic output on the fly. There was a tinniness to the sound running direct into the PA, and the acoustic sound into a guitar amp was not a convincing simulation in my opinion. Trying to run the magnetic pickups through the mix/acoustic output took a lot of the punch away from the magnetic pickups and flattened the sound in a way I did not like, so I rarely run this guitar in this configuration. The solution to the built-in preamp problem was purchasing the L.R. Baggs Para Acoustic D.I. I reviewed previously on this site. This allowed me the needed tonal control to get a very nice convincing acoustic guitar sound through the PA. I have received several compliments on the acoustic sound of this guitar using the L.R. Baggs Para Acoustic D.I. Now here is what is really cool about this guitar, and how I hook it up. As stated in Godin’s web site copy, the Godin Solidac has two outputs. One for the magnetic pickups, and one for the acoustic bridge piezo pickups. Both of these outputs can be used simultaneously. This allows you to get the full power and punch from Godin’s magnetic pickups, which is key (Godin’s magnetic pickups sound quite good). The acoustic bridge pickup sound routed out of the acoustic output allows you to mix the two sounds at the soundboard for a multitude of sounds you just can’t get with a single voice guitar. This is how I route the two signals. The electric guitar magnetic pickups output go from the guitar to my pedalboard to my guitar amp, which is miked into the PA. The acoustic bridge piezo output runs from the guitar to the L.R. Baggs D.I. box direct to the PA through an XLR cable typically. The magnetic pickups have a volume and tone control where the acoustic output has just a volume control on the guitar. The L.R. Baggs D.I. takes care of the tonal adjustments by the player for the acoustic output in this set up. As I mentioned earlier, the array of possible sounds from this guitar is huge with the combination of 3 three magnetic pickups using a Strat style 5 way selector switch. Here are the magnetic pickup combinations: neck humbucker, neck humbucker/middle single coil, middle single coil, middle single coil/bridge humbucker, bridge humbucker. Those combinations alone are powerful! Mix in the acoustic piezo output, and you go to a whole other land of creative tonal options. Your imagination is really the limit here. The wang bar is acceptable on this guitar for me (I am not a big wang bar guy, so I don’t use it much). The vibrato bar system on my Solidac with the locking tuners is good, but it in no way has the tuning stability of a Floyd Rose type locking nut tremolo/vibrato system. If you are big into using the wang bar for heavy dive bombs and such throughout the night I would say look elsewhere. The neck on this guitar is a fast playing neck with nice medium sized frets. I use 10 – 46 gauge Fender Super Bullets. I have found that I get the best tone with the Fender Super Bullets on the Solidac. The Solidac I have is an older model, which was part of a limited run of only 28 guitars that have a Honeyburst Lacewood top instead of their typical cosmetic offerings listed above. My guitar also has a plastic cream colored pickguard where the newer models do not have a pickguard (the magnetic humbuckers are installed using pickup mounting rings, and the single coil pickup is screwed into the body route for the pickup). I’m sure either version would get the job done for you. I really like my Godin Solidac. I bought it sight unseen direct from Sweetwater in 2002 or early 2003. The great thing about Godin is their quality control is very good. I have not yet tried a Godin guitar that did not sound good. That is saying a lot for a guitar manufacturer. If you have the opportunity to try out a Godin electric guitar in a music store, it is what level of good do you want? Pick the guitar that you like best, and you’ll be good to go. I have purchased three Godin electric guitars so far, and they have all been great sounding guitars. 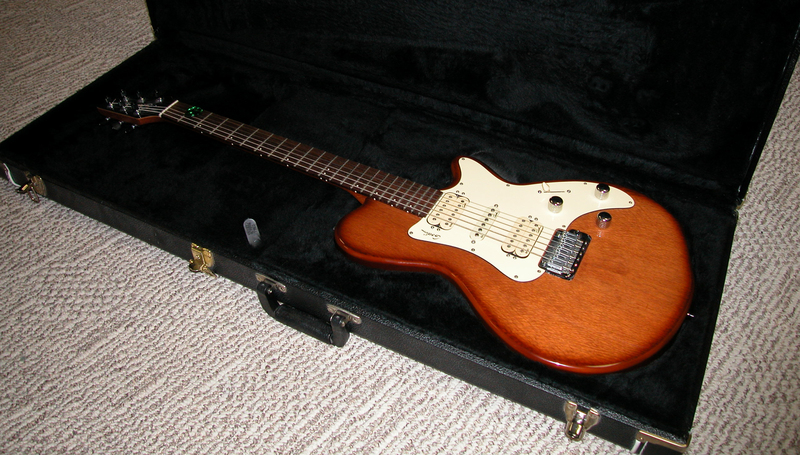 The first Godin guitar I bought I sold, (a Godin LG SP90), and wish to this day that I had not done that! This guitar comes with a story. In the early ’80s I purchased a used 1976 Gibson SG Standard from a friend of a friend for $375.00. This SG was a much better guitar than the crappy imported starter guitars I was trying to play rock music with. The SG was a good guitar, but I had a love hate relationship with it. At the time I couldn’t afford to switch to anything different, so I put my differences aside with the guitar, and got on with making music with the instrument. Flash forward to 2007. I did some research on the internet, and figured out that the 1976 SG collecting dust in the closet was worth about $1,200.00. If it would have been a 1974 model it would have been worth somewhere around $2,000.00. Shoot! Most of my favorite guitarists I looked up to played Les Paul guitars. Namely the Les Paul Custom. I had previously met the owner of the Music Gallery in Highland Park, IL through a client of mine. The Music Gallery specialized in new and vintage stringed instruments at the time. I always wanted a Les Paul since I was a teenager, but could not afford one. I got the bright idea to take my old Gibson SG to the Music Gallery to see how much they would give me for the guitar. They did a little research on the internet, and quoted me $1,200.00. I told the owner of the store I was interested in a new Les Paul. He showed me his wall of Les Paul guitars, and said I could have any of the Les Paul Studios as an even trade. If I were to throw down an extra grand I could have a Les Paul Standard. At that moment I wished I had an extra thousand dollars, but I didn’t, so I started playing one of the the three Les Paul Studios they had on the rack. I had brought my own amp in to test the guitars. This way I was only evaluating the sound quality from the guitar, and not the amp. After I had tested a couple of the Les Paul Studios the sales person who was helping me suggested I try the white Les Paul Studio that was hanging on the wall. This white Les Paul Studio sounded head and shoulders better than the other two Studios in the store. There is a reason for this. This guitar had a feature the other two didn’t. This guitar had an ebony fretboard (I really like the sound of ebony fingerboards) where the other two had rosewood fingerboards, plus the wood in the white Les Paul Studio just sang better than the other two guitars. This guitar had the sound of a Les Paul Paul Custom without the Les Paul Custom price. I was sold on the guitar. The sales clerk put the guitar into its new hard shell case, and I was on my merry way out the door. I never looked back. To this day I do not regret trading my 1976 SG Standard for this Les Paul Studio. Here’s a quick rundown of the features of this particular 2003 Les Paul Studio. Mahogany neck and body. Carved maple cap on the body for extra snap. Klusen style tuners on the headstock. The neck profile is the thicker 50’s style neck. Ebony fingerboard with trapezoid position markers. Bone nut. Chrome hardware throughout. Gibson 490R pickup in the neck position and a Gibson 498T pickup in the bridge position. Three position pickup switch, and two volume and two tone speed knob controls to shape your tone. The guitar has an Alpine White paint job to boot. Out of all of the guitars I own the Les Paul Studio is the guitar I play most often. This Les Paul has the guitar sound I always had in my head. Yeah sure some of my other guitars come close, but when you want that big, fat Les Paul sound the real deal is the way to go. This guitar is definitely the real deal. It has the sound you could easily pay thousands more for, and still be happy as a clam with the price of entry. It is a good idea when shopping for a specific guitar model to play several of them one after another. You will notice they will all sound different due to the variation in the wood the guitars are built with. Pick the one that sounds the best. If you don’t like any of them. Go to a different store and play some more until you find one you really like. 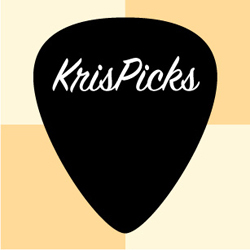 Especially with Gibson guitars the sound quality of guitars of the same model can vary widely. From sounding, not so great, to stellar. I advise to take your time when selecting a Gibson. You tend to pay a premium price for Gibson guitars make sure you actually get a premium instrument. Use your ears, don’t rush the selection process, and you will be fine.